As a Christian Soldier you know we are in funky times. You may have walked with Christ for a long time or just recently committed to the Good Fight. No matter. You have enlisted in the Christian Army and you now work for the Remnant. Yep. That is right. You have your ear to the ground and almost every day you see signs of the Great Battle emerging at both the personal and global front. Possibly a dear friend or family member is attacking you or your finances are in a downward spiral. You could be fighting some serious illness or your marriage is in the pits. These personal difficulties seem to dance in step with the increase in global shifts: natural disasters, war, random crime, and economic decay. Blah, blah, blah. It just never stops. So how do we cope with the new normal? 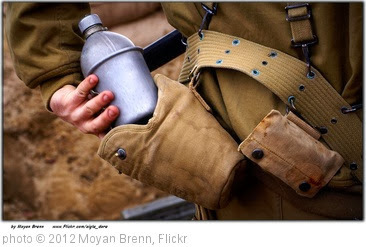 Chatting up other Christian Soldiers can validate our experience but we need more than that. We need peace. Without peace in your heart, you will struggle to cope with the spiritual battle that now surrounds you. So take a deep breath, focus, and get back to basics. Being on Active Duty for Christ requires continuous contact. Remember Noah and the flood? Noah talked to God, listened to Him, and then he obeyed. It really was that simple. First, keep your eyes on Jesus all day long. Talk to Jesus about everything and I mean everything, offering up the good and the bad of your entire day. Greet Our Lord as soon as your feet hit the floor. Talk to him while you brush your teeth, shower, and decide what to wear. Ask Him continually if you are doing what He wants you to do. At night, make sure you chat Him up again and ask for protection while you sleep. Sleeping soldiers are vulnerable to attack. Never forget this. Secondly, listen to His Voice within your heart. Isn’t it amazing how hard this is sometimes? Many of us will send up our joys and sorrows to Jesus but hearing Him talk back can be challenging. Yet this is vital for the Remnant. How can you move forward in murky waters if you have no direction? You can’t. You will drown. It won’t be pretty. So set aside time for daily prayer and regular fasting. Be patient and allow yourself to become quiet. He will respond. Every general communicates with his troops. Persist and He will come. Lastly, act on His Direction. You might be guided to get into your Bible, go back to Church, pray a special prayer or devotion, ring up your preacher or priest, or simply calm down. His communication will be highly personal to you and your need. Not some generic stuff. It is critical that you act upon His Direction as soon as possible. Don’t put it off as Jesus is not messing around. If what you hear seems weird, then pray deeply for discernment and get sound Christian counsel. No solider fights a battle singlehandedly and the enemy will try to weasel his perverse voice into your mind. Do not fret. Typically when the enemy is badgering you that is proof you are on the right track. As you practice reaching out to Jesus, listening to His voice, and acting upon His directives, you’ll get really good at handling your heavenly walkie-talkie. Bottom line is that you can cope with anything if you are in constant contact with the Lord. The new normal will still seem bizarre but you can handle it when you are literally walking with Christ. Remember you are not alone. Jesus and the heavenly realm is totally in your corner.